La Salle senior Jack Rothenberg (bottom) celebrates with teammates after he took a late charge in the Explorers’ 55-47 upset of Roman Catholic. Elbows broke skin, bodies collided, and screws and a plate were thrown around without regard. 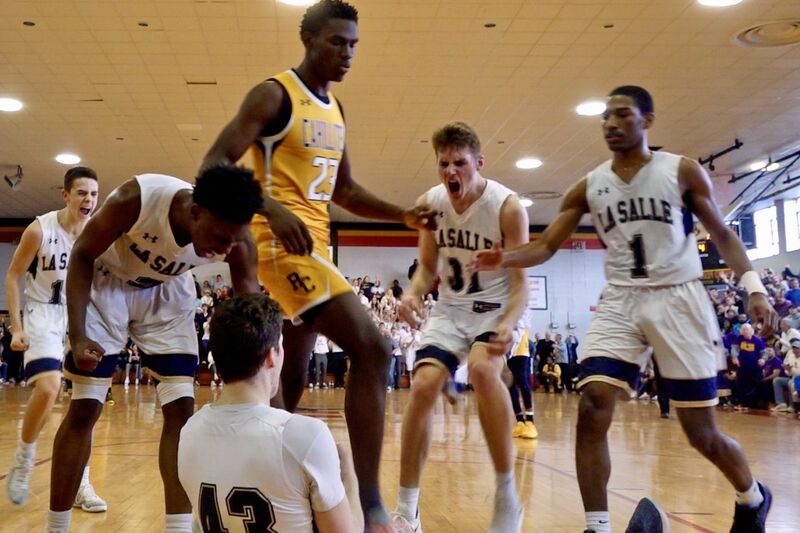 When La Salle knocked off multiple-time defending Catholic League and state champion Roman Catholic on Saturday afternoon, the action on the court at Archbishop Ryan was filled with tension. La Salle senior Jack Rothenberg enjoyed every minute. Saturday against Roman, he took a charge with 3 minutes, 16 seconds left that helped steady the Explorers as Roman showed signs of a comeback. The Explorers (26-3), who had last made the PIAA semifinals in 2014, will next face District 1 No. 4 seed Pennridge (25-4) at 7 p.m. Tuesday at Norristown High. Rothenberg, along with the three screws and a metal plate stabilizing his right tibia, will likely again be used off the bench to provide the Explorers whatever he can offer. In La Salle’s second practice this season, Rothenberg jumped for a rebound and landed on the foot of Princeton-bound senior Konrad Kiszka. A doctor’s evaluation revealed otherwise: a hairline fracture in his tibia. Crestfallen, the 6-foot-4 forward who had looked forward to his senior year could only watch and support as the Explorers started the season with 18 straight victories. His first minutes came in the PCL playoffs against Archbishop Carroll. Early in Saturday’s contest, he calmly drilled a three-pointer. His five points that day gave him 15 for the season. He’s still not 100 percent, he said, but still strong enough to help. Late in the fourth, Roman had cut La Salle’s eight-point lead to six and appeared poised for another slice before Rothenberg stepped in front of a barreling Gabe Perez. Rothenberg had tried to take a few charges during the game, he said, but was called for a block instead. With his back on the floor, eyes toward the ceiling and bodies all around, he heard a whistle but couldn’t see the referee’s signal. Soon after, La Salle pushed its lead to 10. Given what he’s overcome so far this season, what did Rothenberg think of his performance? Kiszka, who twice changed jersey numbers because of blood stains from a fresh cut above his left eye, led the Explorers with 16 points. Roman had won three of the last four PIAA state titles and four of the last five PCL championships. Tuesday night, the Explorers won’t be the only squad with upsets in their bag. Pennridge had thrice lost to District 1 champ Abington and Villanova-bound stud senior Eric Dixon this season, before downing the Ghosts, 55-51, in the Class 6A second round at Bensalem. The Rams, in the program’s first trip to the quarterfinals, beat Methacton, 50-47, Saturday at Plymouth Whitemarsh.